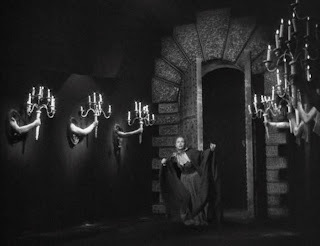 Alien Explorations: Cocteau and "Beauty And The Beast"
Cocteau and "Beauty And The Beast"
One of Giger's first fascination into the world of the surreal was Jean Cocteau's film The Beauty And The Beast. At the time he didn't actually see the film but saw photos from a copy of Life Magazine that American soldiers brought with them when he was a child. His family owned a holiday home up in the mountains and after the war the soldiers spent time recuperating in the area. 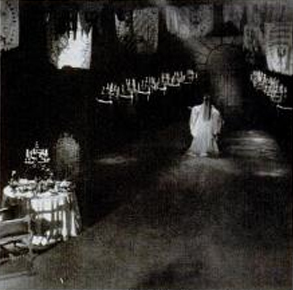 Photograph from"Beauty And The Beast"
When he looked at the magazine, he didn't know what the photos were about let alone know anything about the movie, but he asked his mother who spoke English to explain to him what the long corridors with those arms holding the candelabras was about and she couldn't say either. It was surrealist of course and explaining Surrealism to a young boy was asking too much. Chris Stein: How did this begin? When you were still a boy in the Forties, television didn't exist.